Eric R. Severson, ed., The Least of These: Selected Readings in Christian History (Eugene: Cascade, 2007). xvii + 263 pages. ISBN: 978-1-55635-106-8. Review copy courtesy of Wipf and Stock. While there are usually complex and often understandable reasons behind the decision, there is nevertheless always something deeply disturbing going on whenever someone wants to cut ties to their family and, as it were, start all over again. This is no less disturbing when the sentiment or decision concerns sections of the Christian family or when, for whatever reason, a congregation of God’s people practically live as though God had removed himself from the world thirty seconds after the last apostle died. Thankfully, this is not something that Eric Severson – Assistant Professor of Religion at Eastern Nazarene College in Quincy, Massachusetts – encourages us to do. 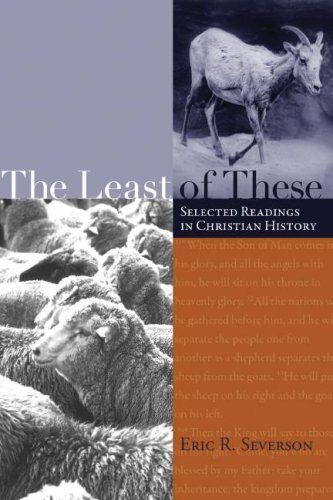 The Least of These: Selected Readings in Christian History comprises of a selection of 28 readings/reflections on Matthew 25:31-46, beginning with Irenaeus in the 2nd Century through to George Whitfield in the 18th. Each reading is well chosen, of suitable length, is helpfully introduced with some background information on its author, and is accompanied by a number of insightful questions for further reflection and a wee list of suggestions of literature for those who want to do some further reading. While most of these readings taken from sermons, letters, exhortations, tracts, and commentaries are in the public domain and easily accessible for those who care to hunt them down (many are taken from the Christian Classics Ethereal Library, for example), it is helpful to have them all in one collection, and in a more modernised form. The operative question that motivates Severson choice for each selection is, ‘How does this important Christian thinker interpret this parable?’ In his introduction, he reminds us that the parable of the sheep and the goats has been used with remarkable range. ‘It has been used to illustrate human dependence on grace, the imperative that Christians be compassionate, the need for good works, the characteristics of heaven and hell, free will and predestination, and much more.’ It is clear that one of Severson’s main motivations for putting these readings together is primarily about helping students gain a deeper appreciation for how Scripture has shaped theology and praxis, and how theology and praxis have in turn influenced how we read Scripture. ‘These passages reveal’, he writes, ‘how theology has been shaped by the historical pressures of heresy, disease, war, and political conflict. These passages are raw; they appear, for the most part, in the context of ministerial concerns and pastoral anxieties’. Along the way, we discover that ‘the concerns of the ancients occasionally sound remarkably contemporary. Clement, for example, shows concern that exotic pets are well-fed while humans go hungry. Gregory of Nazianzus preaches his sermon on Matthew 25 with a wounded indignation after his congregation refused to turn out to hear him preach on Easter Sunday. In the sermon from Luther … he reveals the maturity of his animosity toward Rome and his gentle concern for the fragile and young “Lutheran” church’ (p. ix). Again, Severson’s point is that the theology happens, not in the tower of the cloistered cleric, but ‘in the raw and contextualized stories in which we live’. Therefore, theological doctrine cannot and perhaps ought not be extricated from these settings; hence the large percentage of sermons in the selection. The book is a timely reminder to the Church and to the academy that good theology is that which is both rooted in the exegesis of Scripture, is conversant, humbled and encouraged by the tradition in whose stream it is a part, and which serves the proclamation by and for which the Church lives. As Severson is keen to point out, theology is relevant, it ‘preaches’. Thus his concern to proffer a gentle reminder about hermeneutics and the attendant dangers that arise when we assume a Scripture’s meaning or co-opt a meaning to serve our own particular agenda. ‘Careful exegesis requires a watchful eye on our tendency to find in texts exactly what we expect to find. Good hermeneutics requires a profound openness to the text and to the freedom of its past, present, and future meanings’. But while animals have from nature their unfruitfulness, and fruitfulness, these have it from choice, wherefore some are punished, and the others crowned. And he does not punish them, until he has pleaded with them, put them in their place, and mentioned the charges against them. And they speak with meekness, but they have no advantage from it now; and very reasonably, because they passed by a work so much to be desired. For indeed the prophets are everywhere saying this, “I will have mercy and not sacrifice,” and the lawgiver by all means urged them to this, both by words, and by works; and nature herself taught it. “For I was hungry and you gave me no food,” for even if the one who came to you had been your enemy, would not his sufferings have been enough to have overcome and subdued you? The merciless hunger, and cold, and bonds, and nakedness, and sickness, and to wander everywhere houseless? These things are sufficient even to destroy enmity. One part of favourite parts of Chrysostom’s sermon, however, was omitted: ‘Let us learn therefore to speak in such wise as our Judge is wont to hear; let it be our endeavor to imitate that tongue. And shouldest thou fall into grief, take heed lest the tyranny of despondency pervert thy tongue, but that thou speak like Christ. For He too mourned for Lazarus and Judas. Shouldest thou fall into fear, seek again to speak even as He. For He Himself fell into fear for thy sake’. The one obvious shortcoming to the book is the exclusion of nineteenth and twentieth century examples. I can only assume that this has something to do with copyrights. However, if some of Severson’s goals are to remind us that God continues to speak to his people through Holy Scripture, that we neglect the great tradition of exegesis at our peril, that we have a lot to learn about our own biases, and that ‘Christianity does not occur between the pages of dusty volumes but on the streets and slums of life, where widows mourn, the sick cry out, and the hungry moan’, then why stop in the Eighteenth Century? This shortcoming aside, I enjoyed this book. I enjoyed reading 28 interpretations of one of the NT’s most challenging passages. Nothing compares to reading primary texts! (PhD’s on Paul or Forsyth or Barth or Luke or Shakespeare, for example, are no match compared to reading the men themselves). I delighted that the readings are gleaned from parts of the tradition both familiar and relatively unfamiliar to me. Most importantly, I appreciated being challenged about how I live my own life in light of Jesus’ words. Hi Jason – I just stumbled on this, only 6 years after you wrote it. Thank you so much for this delightful review! You are spot on – I was mostly restricted to public domain texts, so I couldn’t include much 19th/20th century stuff. I was also trying not to prejudice the most recent centuries…but you’re absolutely right, the absence of cool stuff from the 19th-21st centuries is a shortcoming. Anyway, thanks again. I wish I would have seen this a while ago. I’m pleased that you found it, Eric, and I hope that it was as much an encouragement to its author as the author’s labours were to me. Pax, Jason.